Published on October 22, 2017 by Martyn. Be the first to comment! I’m very excited to be able to reveal the cover of my new book – Letters Home, a solo collection of short stories – which is coming out next month. The stories (for adults) include several new ones written especially for the collection, along with some previously unpublished pieces and others which have already appeared in anthologies, newspapers and magazines over the years. “When an out-of-work actor discovers his bedsit once belonged to an obscure, suicidal painter, he turns his talents to re-creating the ultimate site-specific performance . . . Haunting and intimate portraits of vividly different lives that get under your skin and stay there – Jeremy Dyson, co-writer of The League of Gentlemen. 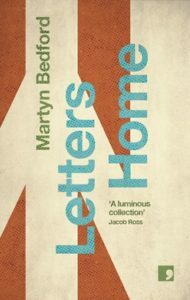 Letters Home further establishes Martyn Bedford as a stand-out writer of highly memorable fiction – Jacob Ross, author of The Bone Readers, winner of the 2017 Jhalak Prize. Letters Home is published on November 16th by Comma Press. Please click here for the Comma website, where physical and digital copies can be pre-ordered.